This week you may have noticed a blue goggly eyed face with vicious fangs staring back at you. This is the face of Tláloc, the Aztec god of rain. 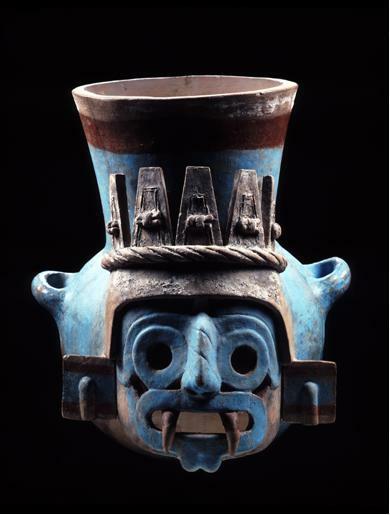 In the form of a beautiful blue vessel recently flown in from Mexico, he is the face of a new exhibition soon to open at Te Papa – Aztecs: Conquest and Glory. Vessel with Tláloc (god of rain), 1440–69, fired clay and pigments. From Museo del Templo Mayor. Consejo Nacional para la Cultura y las Artes – Instituto Nacional de Antropología e Historia. Photographer: Michel Zabe. Tláloc was one of the most important gods. As the god of rain he could provide life sustaining water for the successful growth of crops but if he was angered he could also bring devastating floods, lightning and storms. The Aztecs had many gods and created magnificent sculptures in dedication to them. These incredible artefacts will be on display for the first time in New Zealand, along with beautifully crafted jewellery and everyday items like pottery plates and bowls. Through these objects the story of the Aztecs will be told – how they lived their lives, what they believed and how in just 200 years they went from being landless migrating peasants to the most powerful people in what is now known as Mexico. Monumental sculptural representations of the gods weren’t the only way the Aztecs expressed their dedication to the gods, they also made sacrificial offerings to them. The Aztecs believed they owed the gods for sacrificing themselves in an event that created the world they live in – the era of the fifth sun. But perhaps most importantly the Aztecs believed that if the gods weren’t appeased the sun wouldn’t rise each day and the world could come to an end. They built a massive temple, Huey Teocalli, more commonly known as the Templo Mayor. For the Aztecs the Huey Teocalli was the centre of the universe, a place from which the heavens radiated above and the levels of the underworld descended below. Atop the temple were shrines dedicated to Tláloc and also Huitzilopochtli, the Aztec’s patron god – the god of war. Just as the Templo Mayor dominated the Aztec capital Tenochtitlan, a 1:10 scale model dominates the exhibition at Te Papa providing a dramatic centrepiece from which to explore the Aztec world.